There has been some false news regarding the accounts of Mata Amritanandamayi Math (MAM) in some TV channels and news websites. The MAM accounts department wanted to clarify this info to the public. MAM has never defaulted in submitting Foreign Contribution Regulation Act (FCRA) annual returns. Every year MAM submits the returns before the due date. Please see the dates of submissions and the acknowledgements obtained from Home Ministry. When the ashram contacted the Ministry officials, they said that they have not updated their website and it will take time to update. The medias have taken information from the Home Ministry website. 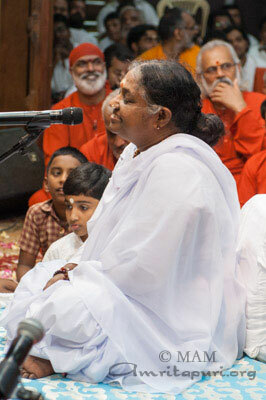 After many years, Amma was physicially present for Guru Purnima in Amritapuri. Even though she had just arrived the previous day from her two month-long world tour, Amma came to the stage at 10.30 am for the function. 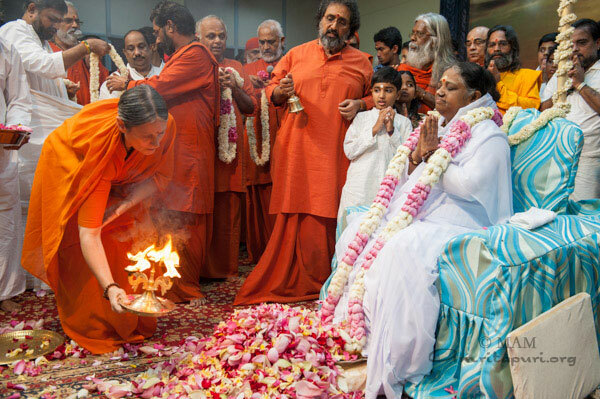 The celebrations began with Amma’s Pada Puja, which was performed by Swami Amritaswarupananda accompanied by the chanting of the Guru Gita and Vedic mantras. 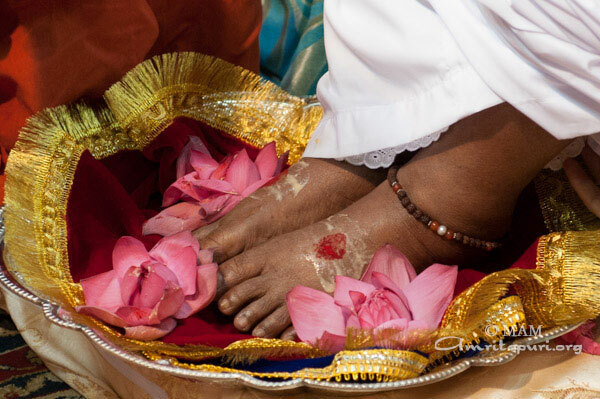 After the Pada Puja and chanting of Amma’s 108 names, all the Swamis offered a garland to Amma. Amma’s Guru Purnima message was then shown on the video screens. In the message Amma said: “One may ask, “The scriptures say that God is within us and not different from our true nature. Then why should we seek refuge in a Satguru?” It is true that God is within us. We are, in truth, the embodiment of Sachidananda—pure existence, pure consciousness, pure bliss. But have we experienced this truth? No, it is being veiled by our ego. We hold the key to the massive treasure chest within us, but that key has become rusty due to a long period of lack of use. Just as we remove rust from a regularly key by applying grease, so too we have to remove the rust of our ahamkara and vasanas—our sense of “I” as a limited body and mind and our deep-rooted tendencies. This will help us realize our true nature. It is for this purpose that we seek refuge in a Satguru. This physical body of ours is nothing but a bundle of meat wrapped up in skin. It has nine doors. And we think “This body alone is me.” Moreover, we continually nourish this misidentification. The ego wants to make us feel superior to others and wants others to show us respect.Everything is God’s creation—except the ego. That is our creation. We have to find a way out of this creation of ours. A wave or a bubble in the ocean is, in reality, not different or separate from the ocean. But what if the bubble clings to the idea that it is just a bubble, not the ocean?In a similar way, we need to remember: “I am not just this bubble of body, mind and ego. I am the ocean itself.” This remembrance can be achieved only through engaging in continuous spiritual practices. When we bow down to a Satguru, we become free from the ego.The truth of our True Self gets revealed. We experience that we are not different from God. God is our true nature. Everything else can be attained by self-effort, but the only way to be freed from the ego is through humility and surrender. The seed and the tree are not different from each other. The whole tree is contained in the seed. But unless the seed goes under the soil and germinates, it will never become a tree. Similarly, when the spirit of surrender dawns in a disciple, freedom from the ego takes place naturally. However much the guru tries to awaken the disciple, unless the disciple is ready to awaken from within, it will never happen. It’s easy to awaken someone who is sleeping, but it is impossible to awaken someone pretending to be asleep. When you break an egg by force, it puts an end to a life, but when the shell breaks from within, life is created anew. In a similar way, when the disciple awakens from within, it is like a rebirth happening. He or she awakens to their true nature. Being with a Satguru is like being a chick being warmed by the body of the mother hen. The guru’s presence creates the favorable climate in which the seeds of divinity within the disciple can sprout. The guru provides us opportunities. It is up to the disciple as to how they are used. After the talk, Amma asked everyone to stand up and dance to the tune of Hari Narayana. As the song’s tempo continually sped up, people cheered and shouted Hari Bol!!! Hari Bol!!! Amma then led everyone in a prayer for world peace. She asked every one to visualize flower petals of peace showering down all over the world, spreading light everywhere. Amma then led all in chanting Lokah Samastha Sukhino Bhavanthu. Then Amma spent the rest of the day receiving all the thousands of people that had come to the ashram to see her after a two month absence. The darshan finally came to an end at 4:35am the following day. After visiting the US Capitol, Amma travelled to New York City for the next stop on the summer tour. 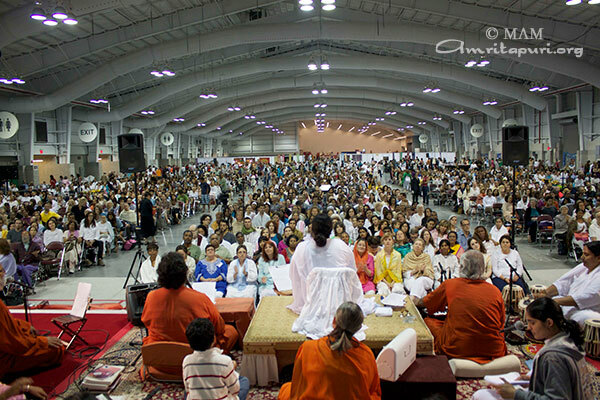 For three days Amma held public programs in the Javits Center, in the heart of Manhattan. As it happens every year, some of the biggest crowds of the tour turned up to receive Amma’s darshan, and listen to her bhajans and satsang. The final program, being a Saturday night, went all night until midday the next day, upon which Amma and the tour group travelled further up the east coast for the final stop on the summer tour in Marlborough, Massachusetts. After her programs at the MA Center Chicago, Amma travelled to the nation’s capitol, Washington D.C. and held two days of public programs there. Along the way Amma stopped with the tour group for an evening picnic in a beautiful state park in Pennsylvania. Everyone sat along the shore of the lake shared a prasad dinner and sang bhajans with Amma as the sun began to set. After bhajans Amma asked everyone to meditate and pray for world peace for a few minutes before continuing the journey. By the time all left dusk gave way to a beautiful night sky and only the light of stars and fireflies could be seen around the lake. Over the next two days Amma held public programs in the Washington DC area gave satsang and sang bhajans, and embraced the large crowds that turned up each day. 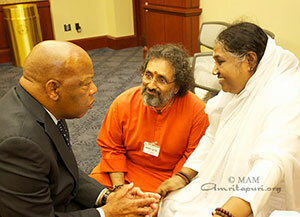 Before departing for the next stop on the tour in New York, Amma spent a day at MA Center in the Washington DC area. In the evening Amma sat outside with the tour group and local devotees and sang several classic bhajans, including Amme Ulakam, Uttama Prematin and Mano Buddhya. The next day, at the invitation of Congresswomen Lucille Roybal-Allard (California) and Betty McCollum (Minnesota), Amma met with more than a dozen members of the United States Congress in the Capitol Building in Washington D.C. on Wednesday, July 10. Among the Congressmen and Congresswomen to meet with Amma were House Minority Whip Steny Hoyer (Maryland) and the civil-rights legend and 2011 recipient of the Presidential Medal of Freedom John Lewis (Georgia). Others included Henry Waxman (California), Grace Napolitano (California), Mike Honda (California), Janice Hahn (California), Mark Takano (California), Jackie Speier (California), Barbara Lee (California), Ami Bera (California), Ruben Hinojosa (Texas) and Jan Schakowsky (Illinois). Amma gave each of the Congressmen and Congresswomen her heartfelt embrace and sat with them, one on one, in private discussions. Many were visibly moved by the experience and by Amma’s humanitarian activities. Also present were more than 50 of the Congressmen and Congresswoman’s staff, who also had Amma’s darshan and discussions with Amma. Upon concluding the meeting on Capitol Hill, Amma travelled to New York City, where she is holding programs July 11 through 13th. After wrapping up the programs in Canada, Amma and the tour group traveled back to the United States and held 3 days of public programs at the MA Center Chicago. This was Amma’s second visit to the center located just outside of Chicago in the town of Elburn, Illinois. On the way back from Toronto, Amma took the time to stop with the tour group on the banks of Lake Michigan amongst huge sand dunes. All sat under a small shelter at the edge of the sandy shoreline to stay out of a steady rain. Everyone shared a BBQ picnic lunch with Amma enjoyed a satsang and bhajans. As the sun began to set, the clouds parted and Amma led everyone down the the water’s edge. She led everyone in singing Shristiyum Niye and Devi Jaganmata while she raised her arms skyward and gazed out upon the waters of the Great Lake. Before leaving, Amma walked down the beach alone and spent some time feeding flock of seagulls. It was a rare and beautiful scene to see Amma getting to spend a few moments alone communing with nature. Upon arrival to the program hall during on the first day, Amma was greeted by the Creekside Singers from the Pineridge Reservation in South Dakota. The members of the Oglala Lakota Tribe danced and played a ceremonial drum to welcome Amma. Later that day Amma was felicitated by the Mayor of Elburn, David Anderson, who was also on hand last year for the Center’s inauguration. 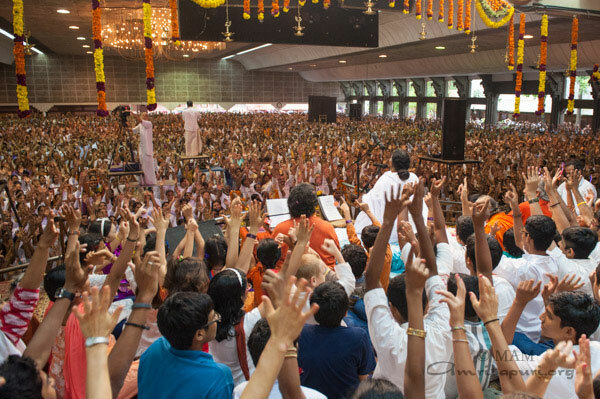 Amma spent the next three days giving darshan, singing bhajans and giving satsang to the massive crowds that showed up over the 4th of July Independence Day holiday weekend. When the final program ended late in the morning Amma and the tour group travelled on to the next stop on the tour in Washington D.C.
After the Iowa programs Amma and the tour group crossed the border into Canada for four days of programs in Toronto, Ontario, Canada. 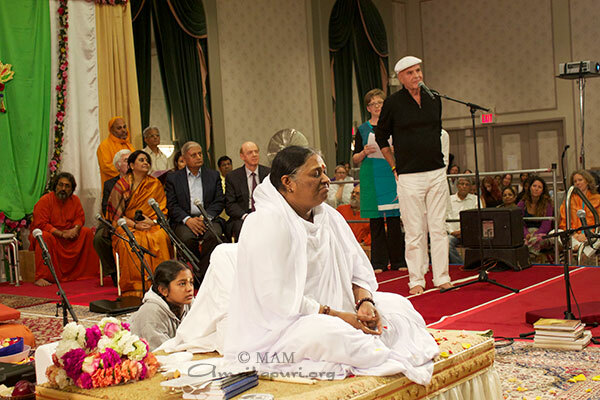 This was Amma’s 10th visit to Toronto. Each of previous visits marked the end of the summer tour, but now for the first time the Toronto programs fell in the middle of the tour. Before crossing over into Canada, Amma stopped with the tour group on the banks of the majestic Lake Huron, one of America’s ‘Great Lakes.’ When the caravan arrived there it was pouring rain, but that didn’t dampen anyone’s spirits. Almost 300 people managed to squeeze around Amma under a small picnic shelter on the shoreline. Amma gave satsang, shared jokes and a prasad dinner with everyone. After the meal the clouds parted and the sky began to open up as the sun was setting. Amma then led everyone down the water’s edge and looking out upon the vast body of water, she sang Shokham Idu Enthinu Sandhye and Shritiyum Niye. After the beautiful stop with Amma, the caravan continued across the border and on to Toronto. 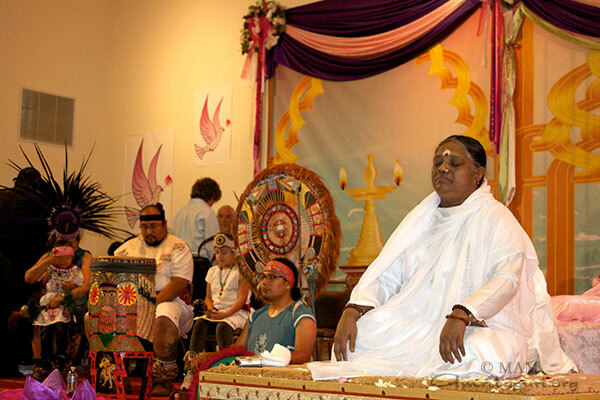 Over the next four days, Amma held one day of public programs and a three day retreat. During the first evening program in Toronto Amma was welcomed by several dignitaries, including internationally renowned author Dr. Wayne Dyer and former Indian Navy Chief and now current Indian High Commissioner to Canada, Admiral Nirmal Verma. Dr. Wayne W. Dyer, Internationally renowned author and speaker in the field of self-development, welcomes Amma. 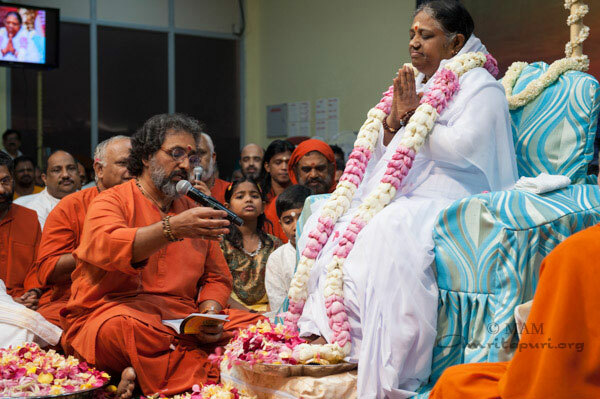 After the final program ended in Toronto, Amma and the tour group headed back to the US to MA Center Chicago for the next stop on the 2013 America Yatra.